Universal Orlando Resort announced that special vacation packages will go on sale Sunday, July 31st that will give guests the opportunity to attend “A Celebration of the Harry Potter Films.” This special event will be hosted by Warner Bros. and will celebrate a decade of movie history by allowing fans to share their love for the Harry Potter films. 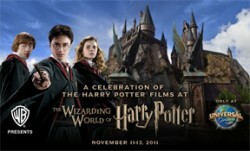 The event will take place from Friday, November 11, to Sunday, November 13, at Universal’s Islands of Adventure, home to The Wizarding World of Harry Potter. The primary way to participate in celebration events is by purchasing one of Universal Orlando’s special vacation packages. Packages are extremely limited and go on sale at noon EDT on Sunday, July 31. Guests can choose from two vacation package options: the Celebration Vacation Package and the Premier Vacation Package. For more information about the event and vacation packages, visit www.universalorlando.com/celebration.